Do you live along the upper gulf coast and want your porcelain or ceramic tile and grout to look sensational again? And with good reason. We start by applying a grout restorer to the floor to begin to loosen all the imbedded cleaning products and dirt that have dulled your tile over time. We then hand scrub all grout lines for maximum cleaning. Next, we use our patented high pressure equipment to apply 1500 pounds of water pressure at 140 degrees of heat. As the high pressure rinse is being applied the equipment then uses twin 6.5 horsepower vacuum systems to pull out dirt and automatically pump it away, you can see the tile luster and the clean grout lines re-emerge. 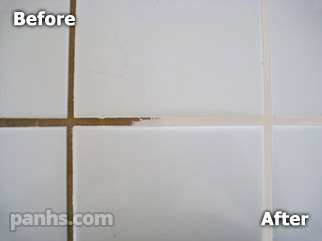 After we restore the original color of the grout lines, we can then seal the grout, which makes maintenance easier. 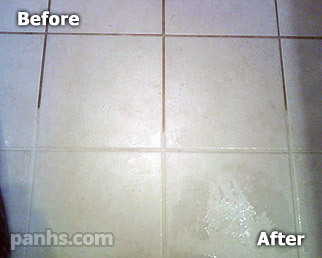 Your tile and grout looks fresh and clean! Better than new! Our process can restore sanded grout to its original color plus provide a topical seal dramatically enhancing your grout's natural stain resistance. This process is so effective it can even be utilized to alter the color of your grout. Suitable for use with sanded grout only, making this a common ceramic or porcelain surface treatment. This chemical treatment introduces a colored topical seal designed to bond to the silica in the sand filler. (Note: sand is not typically used with marble and granite surfaces as the loose sand can damage the stone surface). Looking for a means of getting your original grout appearance back? Whether stained or not our color sealing(grout staining) provides the best route to a uniform, consistent grout. The treatment offers the additional benefit of offering exceptional improvements in stain resistance allowing you to maintain your beautiful floor appearance for years to come! In need of an estimate? Contact us here! © Panhandle Home Solutions LLC. All rights reserved.